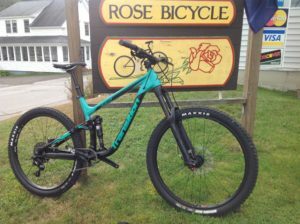 Rose Bike | What is New? Just in are Trek Verve+ pedal assist bikes. These have the ability to extend your ride, get you back on a bike or commuting by bike a reality. Click the link for more information or come and see us with your questions. Swan’s trails are being groomed. The new snowdog purchased by Rose Bike Cycling Club has been put into action at Perch Pond. Thanks to some dedicated volunteers there are now about 8 miles of excellent fat bike trails to enjoy. So far it has definitely lived up to expectations! If you want to see for yourself, access is from the parking lot on Poplar St. (The first part is private land and not groomed.) Have fun! Try a Fat Bike! Now renting. You keeping hearing about them; you are kinda intrigued and now you can rent one from Rose Bike to try out. 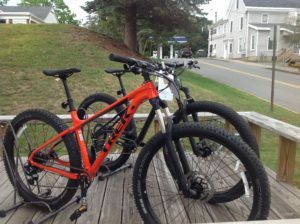 We have Trek Farley 5 bikes to rent- $35 half day (4 hours) or $55 full day. Most people will agree these bikes are maximum fun on a well groomed snow trail but they can be ridden on trails year round. Stop in and find out more. We have a full size run and one kids bike. 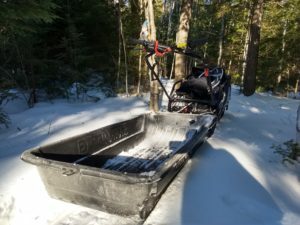 With fundraising through Rose Bike Cycling Club, we have purchased a new trail groomer for fat bike trails at Perch Pond (The Rick Swan System). The snow dog comes highly recommended and we are pretty excited to put it through it’s paces! Many thanks to everyone who donated to make this possible. If you intended to but have not yet, your money is still very welcome for running and maintenance costs. You can donate through gofundme or cash or check. We have not received enough snow to use this for grooming yet, but Jim took it out for a spin! Please contact the shop if you would like to be trained as part of the grooming crew. RBCC presents the Retro Ride: August 19th at 3pm. Do you have an old bike you love too much to get rid of? This is your chance to polish it up and show it off! Don’t have a retro bike? 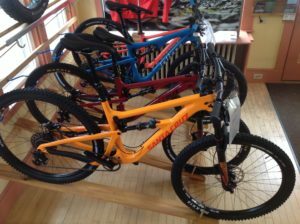 You are in luck-check out the ongoing silent auction at Rose Bike (see our facebook page or call the shop) to get one. 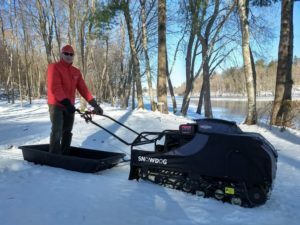 Profits go to the fund for a new Snowdog to groom winter fatbike trails at Swan’s trails, Perch Pond. 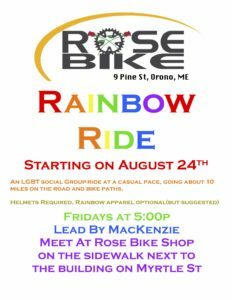 This ride will be very relaxed ending back in downtown Orono where we can hang out, partake of cool refreshments and talk about all things bicycle. Santa Cruz and Juliana full suspension bikes are in stock. 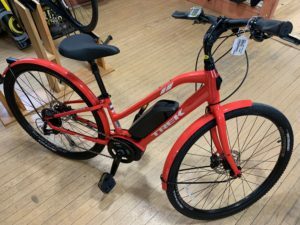 We have the redesigned 2018 Transition Smuggler and a full range of Trek Bikes from the affordable 820 to the Fuel EX. ‘Gravel Grinders’ are a popular bike these days and open up the possibility of some different rides on paved and dirt roads. 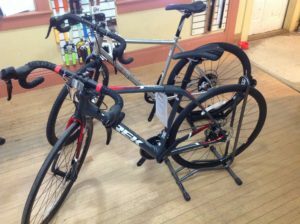 We have a couple of options that we really like in the store: the Trek Crossrip and the Otso Warakin. Come and ask us what we like about them. 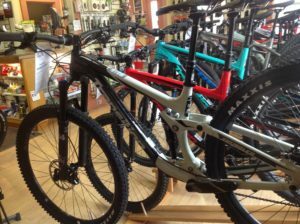 If you are more of a road rider but would like the option to ride some dirt you might want to look at the new Trek Domanes. Disc brake models have clearance for 32c tires and Isospeed absorbs some of the road jarring for a more comfortable ride. Of course both the Domane range and lightweight Emondas are a great choice for any road rider. Most are available with disc or rim brakes. We are constantly looking for new products on the market. As well as reading reviews we often test them ourselves. 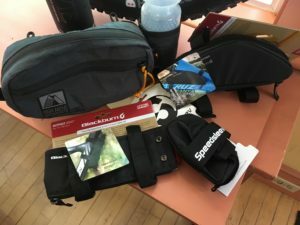 Whether you are thinking of getting a dropper post, wondering how to carry tools and snacks because you already have a dropper post or just want a new look for your road bike this spring we have options for you. Running tubeless tires? Ask us about Dynaplug tools. If you ski as well as ride we can sell you wax for your cross country skis or can do the job for you. 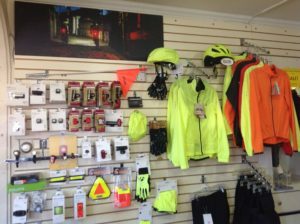 We have stocked up on high visibility and reflective clothing so you can be seen better. We also have a large selection of lights so you can see and be seen! Many of these are now USB rechargeable which means no more batteries! 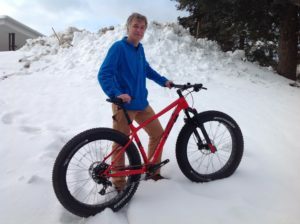 New Farley fatbikes have arrived and the popular Stache with midfat tires is back in stock. A new addition to the Trek lineup is the Roscoe with plus sized tires for a fun ride. You can see these bikes on the Trek website. The Otso Warakin is a steel framed gravel-grinder: an interesting new addition. Come and take a look at it and get more info. 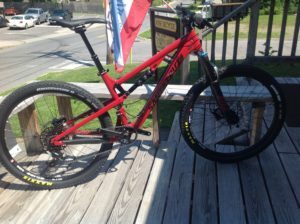 Otso makes one other bike that is also cool and just got a great review. We have a few Transition bikes still in stock. This west coast company makes some very nice bikes (with 27.5 and 29inch) wheels. Changes are in store for the 2018 lineup which means current bikes are on sale! Santa Cruz and women specific Juliana bikes are also getting some changes in some of their models. including a new lower-priced Joplin with an aluminum frame. 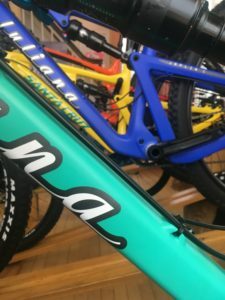 Several Santa Cruz models are available with 3 different framesets for different budgets.We will be getting some 2018 models in the store in due course. Call or stop in for pricing and availability! 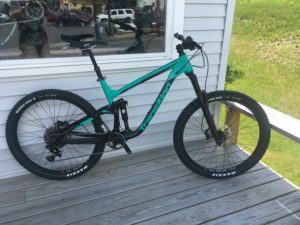 This trail enduro bike is a lot of fun with 27.5 inch wheels and 160mm travel. Now on sale. Large frame size. Call or stop in for details! 2018 fat bikes are on sale-just a few left in stock.